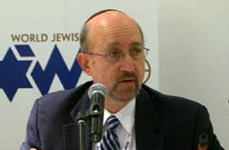 Dr. Stanley A. Urman is the Executive Vice-President [Executive Director 2002-2008] of Justice for Jews from Arab Countries, an international coalition seeking rights and redress for Jews displaced from Arab countries. Since 2002, Dr. Urman has made formal representations on rights and redress for Jews forced to flee Arab countries to Members of Congress, and to senior Administration officials in the United States, Belgium, Canada, France, Great Britain, Italy, Russia, and the European Union. In Israel, Dr. Urman made numerous political representations, urging Israeli Government action, to President Moshe Katsav, Prime Ministers (Yitzhak Rabin, Ehud Barak, Ariel Sharon); Foreign Ministers (Shimon Peres, Shlomo Ben Ami, Benjamin Netanyahu, Silvan Shalom, Tzipi Livni); Justice Ministers (Yossi Beillin, Tommy Lapid, Meir Sheetreet, Daniel Friedman); other ministers (Natan Sharansky); and senior officials. He has testified at public hearings before the Canadian Parliament, the House of Lords in London, and the U.S. Congressional Human Rights Caucus. He has contributed to the development of two Congressional Resolutions on the rights of former Jewish refugees from Arab countries, one of which was unanimously passed (H.Res. 185) in April 2008 and another currently being considered by the U.S. Senate. Previously, Dr. Urman served as Executive Director of the Centre for Middle East Peace & Economic Cooperation, Executive Vice President, America-Israel Friendship League; Executive Director of the Canadian Human Rights Foundation; and National Executive Director of the Canadian Jewish Congress. Having received a Bachelor of Arts from Sir George Williams University, and a Masters of Science in Social Studies from Boston University, Dr. Urman received his Ph.D. in Middle East Affairs at Rutgers University's Centre for Global Change and Governance.